In an organization, the favorable combination of physical and human factors influences the motivation, satisfaction and results of the staff. It also impacts other important aspects such as safety, productivity and quality. This is a methodology that gives special value to the improvement of the existing, relying on creativity, initiative and staff participation. It is considered by world-class organizations as the basis for the application of Just in Time (JIT), Total Productive Maintenance (TPM), Total Quality Management (TQM) and excellence. It is also one of the basic principles of lean manufacturing to maximize efficiency in workplaces. It arose from the orientation linked to the total quality that originated in Japan by Deming in the 60s and 70s. 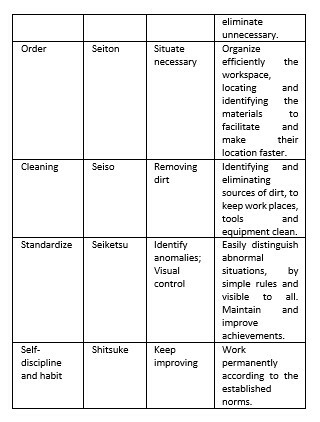 It is a methodology developed in the 70’s by Japanese company (TOYOTA) to achieve with a systemic approach lasting improvements in the level of organization, order and cleanliness. It is based on Kaizen, whose translation from Japanese means change (kai) to become good (zen), that is, continuous improvement. From the 90’s proliferated its application in countries on all continents. Its application is not exclusive of a certain culture or country, since they have been applied in several countries with remarkable success. Today is a program to improve productivity in all countries. Let’s define what are the 5S’s? a. 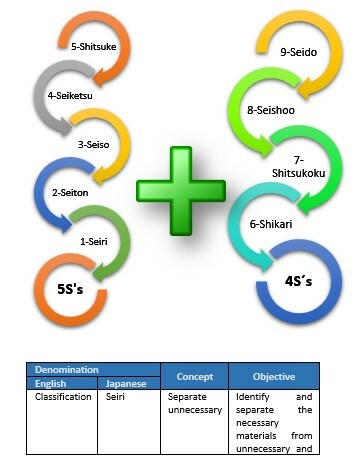 The 5S’s represent principles expressed with five Japanese words that begin with S and that comprise the methodology. b. They are not something totally new, since it is a reflection of the attitudes and behaviors within the organization and the commitment of senior management to the staff. c. The number of S varies in each organization, but the objective is the same: Create the habit of respecting the established, defined and agreed. Total Quality Control in the Japanese style is a conceptual revolution in management. By instituting this methodology throughout the company, can contribute to improve the health and character of it. This input becomes more important as the industry progresses and the level of civilization rises. Modern quality control began in the 1930s with the industrial application of the control chart devised by Dr. W. A. Shewhart of Bell Laboratories. The Second World War was the catalyst that allowed to apply the control chart to various industries in the United States, when the simple reorganization of the productive systems was inadequate to meet the demands of the state of war and semi-war. When the American occupation forces landed in Japan, they immediately faced a major obstacle: frequent failures in telephone service. The Japanese phone was not a reliable means of communication. The problem was not only due to the war that had just ended, but the quality of the equipment was uneven and deficient. Seeing these shortcomings, US forces ordered the Japanese communications industry to start applying modern quality control. In addition, they took measures to adduce the industry. This was the beginning of statistical quality control in Japan in May 1946. These occupation forces imparted their teachings to Japanese industry by transferring the North American method without any appropriate modification to Japan. This created some problems, but the results were quite promising and the American method soon spread beyond the telecommunications industry. By promoting QC activities, we realized the differences between Japan and Western countries. Through this work you can identify certain characteristics of Japanese quality control that I will describe in this article. Many methods of control were introduced into Japan after the war, but none was compatible with quality control because of its ability to take root firmly, to be fully applied and to achieve success and then re-exported to the West. Taking full advantage of the characteristics of Japanese quality control, the products of that country reached the highest quality in the world and were exported to the whole globe. 1. Quality control throughout the company; participation of all the members of the organization. 2. Education and training in quality control. 3. Activities of QA circles. 5. Use of statistical methods. 6. Quality control promotion activities at national level. What steps can be followed? If you were to describe the entire control procedure, the pages of this article simply will not suffice. Therefore, I will limit myself to a brief outline. Dr. Taylor used to describe control with the words “plan, do, see”. What does “see” mean? for Japanese Secondary students, it means simply looking at something. This does not convey the meaning that Taylor wanted to give him. Therefore, I prefer to say “plan, do, verify, act”. This is what we call Control Circle and we have to make it move in the right direction. I thought it advisable to redefine this circle by dividing it into six categories. Control must be organized based on these six categories, which have proven their effectiveness. 1. Determine goals and objectives. 2. Determine methods to achieve the goals. 3. Provide education and training. 5. Verify the effects of realization. Giving and receiving information is one of the most important elements for the self-realization of the individual in the organization. The suggestions system not only benefits the company, but also the worker, because it tends to focus their attention and interest and makes them aware that the company is concerned about the tasks they perform and that the company is also willing to reward them for providing suggestions and through them improving working methods. The success of this suggestion system will depend on the support of the managers, so that the suggestions are recognized and appreciated carefully. If a suggestion can not be used the way the worker presented it, a certain modification can be made. So that the system of result suggestions should be widely disseminated. Both workers and supervisors should be perfectly well aware of the objectives, the way they can participate and the benefits they will have when submitting a suggestion to that system. For the suggestion system to inspire confidence, the participation of managers, assistant managers, even the line supervisor must be excluded; The reason for all this is that the aforementioned are in a better position to propose improvements to the operation of the company, and in which case they will be simply fulfilling their obligation, and on the other hand, they could, suggest that they have some influence on the committee that selects the suggestions. There are two types of suggestions, those of calculated value and general ones. It is recommended that the prizes for the calculated value suggestions represent a reasonable percentage of the savings that will be obtained with the implementation of the suggestion, as well as recognition by both the writer and the public. In the case of general suggestions, prizes are often fixed, in cash or in kind, in addition to a written and public acknowledgment.